ACT Anticavity Fluoride Rinses and Mouthwashes | Chattem, Inc. The fluoride protection in ACT mouthwashes and rinses strengthens enamel and increases resistance to acid, preventing demineralization and aiding in remineralization. Studies conducted with ACT have shown decreased coronal caries in both children1 and adults2 who rinse daily, reduction of root caries by up to 71%1 with daily use, and halting of active enamel caries lesions.3 ACT, with 25 years of clinically proven fl uoride protection, offers: • ACT Anticavity, the original alcohol-free formula with flavors for adults and children. • ACT Restoring, a low alcohol (11%) formula available in Mint, Spearmint, and Vanilla Mint. 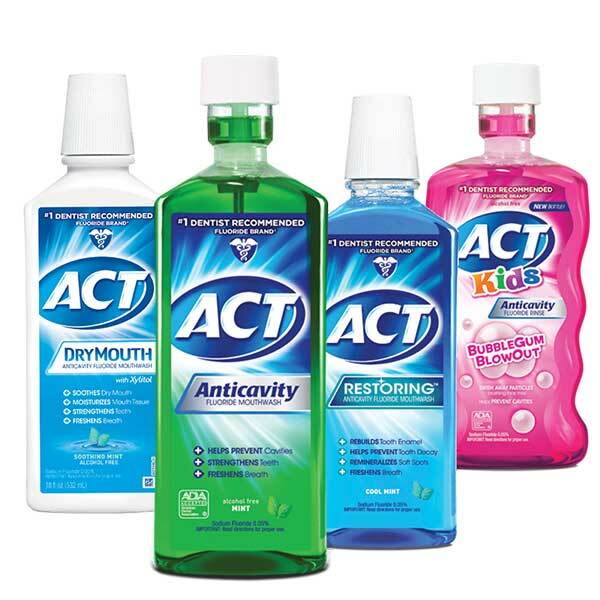 • ACT Total Care, available in an alcohol-free rinse and a lowalcohol (11%) mouthwash. REFERENCES 1. Wallace MC, et al. The 48-month increment of root caries in an urban population of older adults participating in a preventive dental program. J Public Health Dent. 1993 Summer;53(3):133-137. 2. Heifetz SB, et al. A comparison of the anticaries effectiveness of daily and weekly rinsing with sodium fl uoride solutions: fi nal results after three years. Pediat Dent. 1982;4(4):300-303. 3. Duarte AR, et al. Effectiveness of two mouth rinses solutions in arresting caries lesions: a short-term clinical trial. Oral Health Prev Dent. 2008;6(3):231-238.